Into our frenzied post-Parkland debate about such things as the value of a good guy with a gun comes the clumsy Death Wish, which assesses the value of … let's call him a bald guy with a gun. The question rages in Death Wish, which is set in Chicago, ground zero for gun violence, a topic debated by snippets from local talk shows. Arguments between disc jockeys and callers blare over the opening credits, and director Eli Roth works these discussions into his narrative as it unfolds, anticipating the criticism he knows he's going to get that can be read as gun glorification. Does it work, including discussions of real gun violence? It might, if it were a better movie. The setup is a Town & Country version of the 1974 Charles Bronson original. Wealthy surgeon Paul Kersey (Bruce Willis) lives in a posh Lakeshore Drive home with his brainy, beautiful wife (Elizabeth Shue) and lovely, prep school daughter (Camila Morrone). 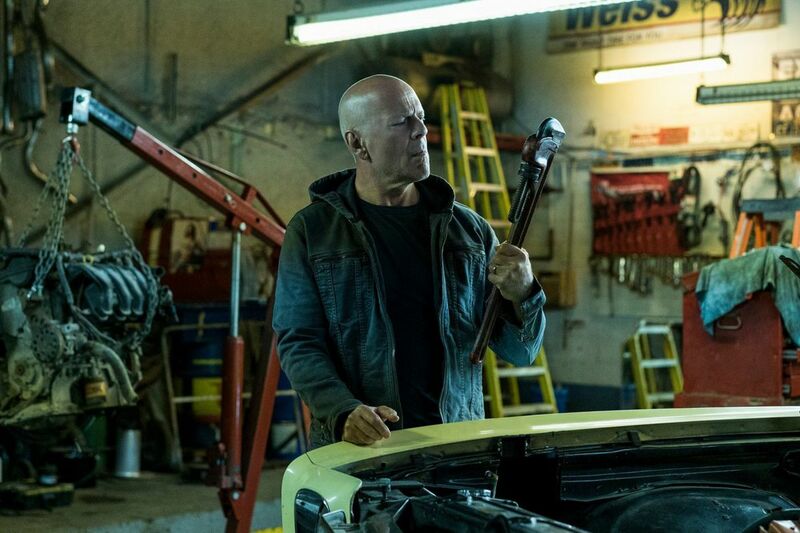 The family is perfect to the point of being blandly generic — Roth should have learned something from Taken, a neo-Death Wish in which the vengeful, weaponized father was acting to repair and reunify his fractured family. The Kerseys are without flaws, or rifts (or personalities). Mrs. Kersey is about to get her Ph.D., the daughter has just been admitted to a prestigious university, and of course they're both about to be assaulted — by low-life burglars, who break into the Kersey house and end up attacking the women when they fight back. (Because it's a Roth movie, one of the thugs uses his gun to sexually menace a bound female). Devastated dad consults with overwhelmed police detectives (Kimberly Elise, Dean Norris), concludes they are too slow and too ineffective, and considers taking the investigation into his own hands. He also wrestles with his own rage – first in fruitless sessions with a therapist (Wendy Crewson), then by acquiring and firing a pistol. The point of these encounters is to provide the frustrated Kersey with an outlet for his rage and fury, but there's a problem – Willis doesn't impart those emotions to his character. There is something curiously muted about his performance. Killing strangers works on him like Xanax – when his therapist asks him why he's suddenly in such a placid mood, he gives her a mellow smile. (In the original, Bronson vomits when he realizes what he's done). All of this makes for a wishy-washy exploitation movie, which doesn't show any real verve until the climax — Kersey taking on all comers at his now-fortified mansion, with a legally acquired arsenal. I preferred Charles Bronson and his sock full of quarters. That's a movie that stays with you. I still haven't forgiven Jeff Goldblum (billed as Freak #1) for what he did to Hope Lange. Directed by Eli Roth. With Bruce Willis, Elisabeth Shue, Dean Norris, Kimberly Elise, Camila Morrone, and Vincent D'Onofrio. Distributed by MGM. Running time: 1 hour, 47 mins.